Senator Brian Kelsey wants all nine of Tennessee's state universities to compensate their student-athletes. Kelsey introduced a resolution on Wednesday opposing NCAA policy prohibiting college athletes from getting paid. 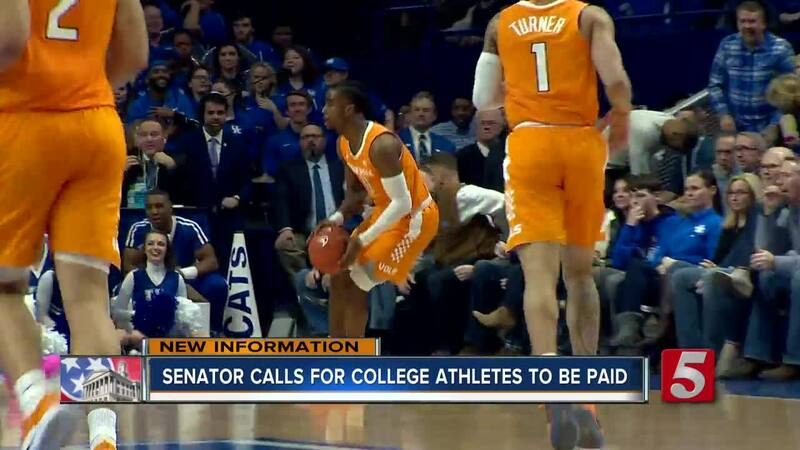 NASHVILLE, Tenn (WTVF) — One state senator wants all nine of Tennessee's state universities to compensate their student-athletes. Senator Brian Kelsey introduced a resolution on Wednesday opposing NCAA policy prohibiting college athletes from getting paid. In the resolution Kelsey calls a "lack of compensation of student athletes at the collegiate level is a fundamental violation of the free-market principle of economic liberty." The Senator went on to say the compensation of student athletes at the collegiate level is an important civil rights issue of this generation. "Many collegiate student athletes, especially those playing football and men's basketball, are little more than indentured servants, unpaid by the universities and athletic departments for which they generate millions of dollars in revenue," said Kelsey. Kelsey said a bachelor's degree is a great achievement, but a "free college education does not adequately reimburse student athletes for their labors." "I think they're being taken advantage of and I think they're bringing in tens of millions of dollars into our public universities and they're not getting one dime, and that's just not fair. He intends on sending a copy of the resolution to all 9 university presidents," Kelsey told Newschannel 5. Some fans we caught up with enjoying the SEC tournament agree. "All the top people in the NCAA from the athletic directors to the coach and everything they make millions and the players are the ones bringing in that money and they don't see any of it; I think they deserve to see a portion of that," said sports fan Dylan Troyer. CBS Sports reported last year, the NCAA produced nearly $1.1 billion in annual revenue during the 2017 fiscal year. "There's an awful lot money being made by an awful lot of people on the backs of college athletes," said Sam McMaster. But many fans are a little skeptical about the idea of paying student athlete. "I have mix feeling about it, I mean in some cases they are already getting paid because they're getting a really good education, but on the flip side I think they should get a percentage of the game," said Adrian Summerour. Senator Kelsey did mention that some conferences offer player stipends. He said its a start but it's also a small amount compare to the amount revenue conferences are bring in. Last year the NCAA, responded to claims of paying athletes. In response the NCAA president said compensating college players especially it's male athletes would result in athletic departments eliminating other sports.